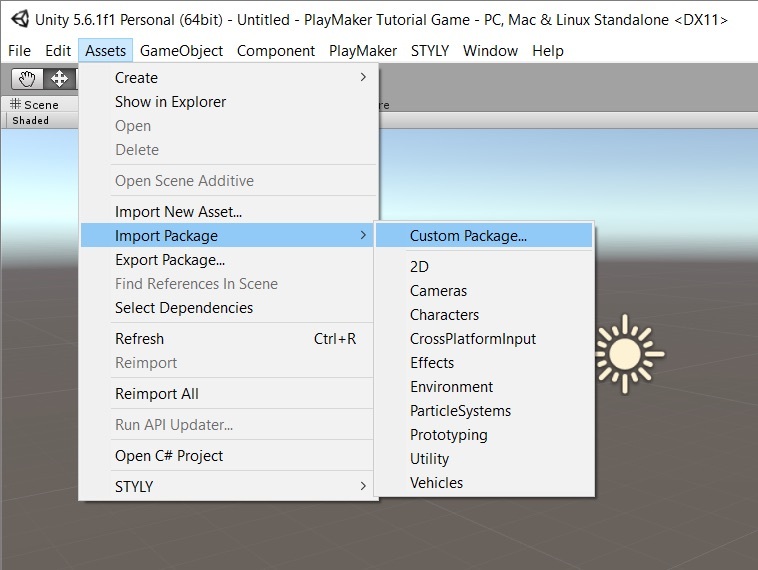 The goal for this article series is to use PlayMaker in Unity to create a FPS shooting game, and export it to the STYLY editor. There are 7 articles for this series, so if you roughly look through the series first, I think you will get the general flow of the tutorial. In this article, we will learn how to import assets and do the general setup for the game. In this sample game, the player stands in a flying arena, and has to hit anime characters running towards you with a teddybear gun. Will you be able to survive this cute threat!? Let’s open Unity. Create a new project with the following settings. Name the project “PlayMaker Tutorial Game”, and choose where you want to save the project files. If there is an organization you are in, enter the name in the Organization field, and press Create Project. In order to use playMaker, you have to purchase it from the Hutong Games online store. Access Hutong Games, and click the Store tab, and proceed to the playMaker purchase page. Click the big playMaker banner, and proceed. Enter the quantity of playMaker(s) you want to purchase. I will purchase 1. Click the “Order Now” button at the buttom of the page, and complete your purchase. There are addons for Windows phones and Blackberrys, but we will not be using them in this tutorial. Once you enter all the details for your payment, the software will be purchased. When the purchase is complete, a ZIP file will be downloaded. 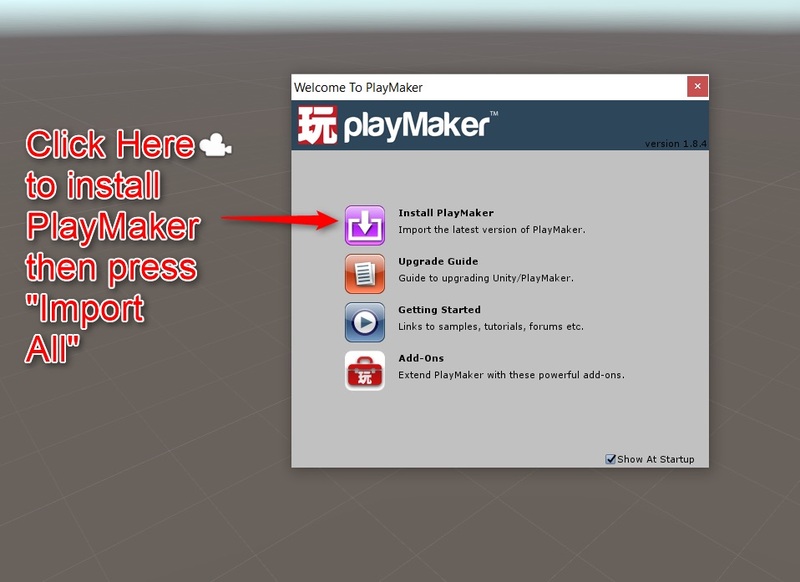 Unzip the file, and you will be prepared to import the playMaker package into Unity. 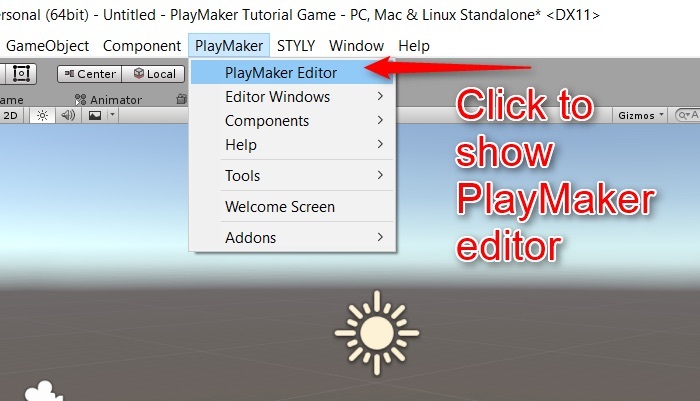 Once you finish downloading playMaker, open the Unity Project you created in previous step. Choose the Assets menu at the top bar, and click Import Package > Custom Package in the dropdown menu. Next, place the playMaker file, and choose it. An instructions window will popup in the screen, so follow the instructions. When you finish, you will end up with a screen like the one below. Check the Assets folder, and add the next 3 folders. “myPrefabs” is a folder to save all the Prefabs you are going to create in the project. 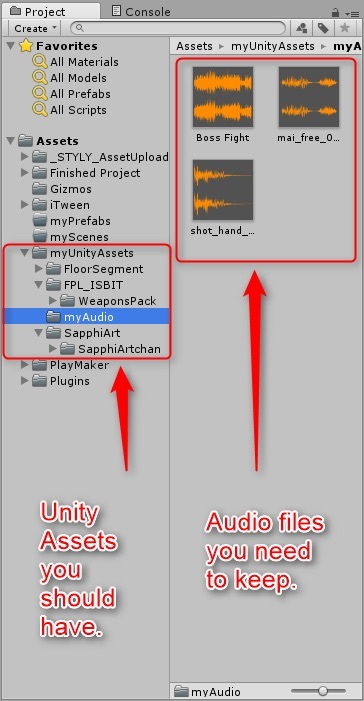 “myUnityAssets” is a folder to save assets such as music files that we use in this project. 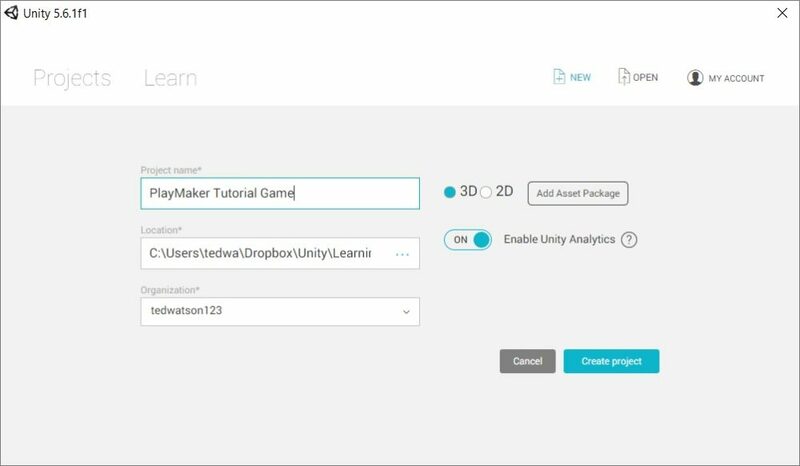 Next, open the Unity Asset Store. As shown in the screenshot above, search for an weapon asset called “First Person Lover”, and click the download button. 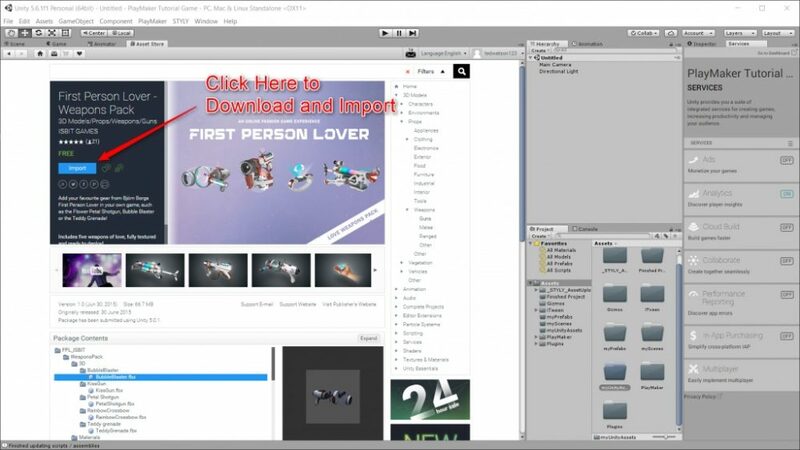 Once the download is complete, click Import to import the asset package to Unity. If you cannot find the asset, you can use this link too. Other than this, we will use the following 5 packages in this sample project. Please download and import these with the same process. 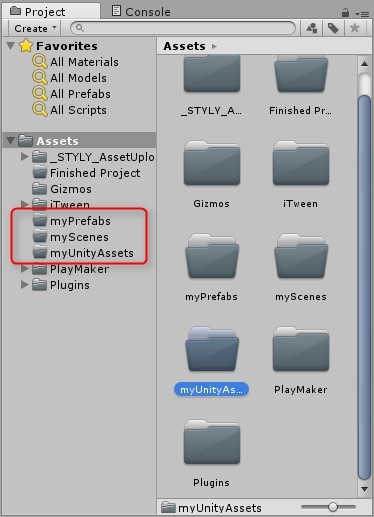 When you’re done, move the all to the myUnityAssets folder. Create a sub-folder named myAudio. Open RPGPuzzleGameMusicFolder, and click Music, Looping, Wav, and drag and drop the Boss Fight track to the myAudio folder. By doing so, the game BGM will be set on an infinite loop. By deleting unneccesary files, the upload process to STYLY will become shorter, and you can stop the project from having messy folders. Next, please go to the mai_free_voices folder, select the wav folder, and choose the mai_free_08_damage audio file, and move it to the myAudio folder, just like you did for the previous file. This is the audio file that will be played when the enemy character gets hit. You can delete the mai_free_voices folder when you’re done. Finally, go to the FuturisticWeaponSet folder and click the hand_gun folder. Move the shot_hand_gun audio file to the myAudio folder. Delete the FuturisticWeaponSet folder when you’re done. You should now have files and folders arranged like in the screenshot below. Next, click the PlayMaker tab and drag the editor to an appropriate position. In this sample project, I placed it on the bottom left, so that I can access it easily. 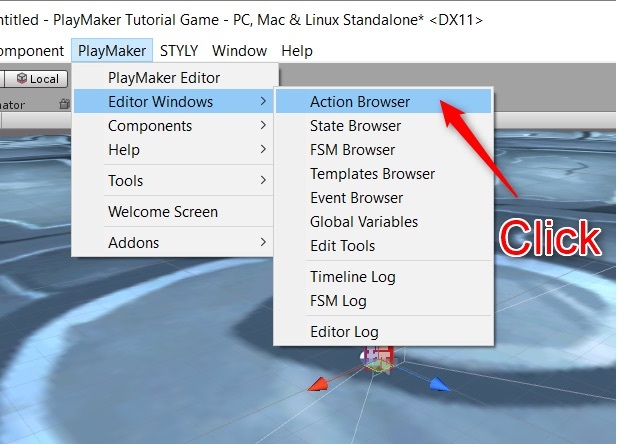 Then, click the PlayMaker tab in the menu bar, and choose Editor Windows > Action Browser. A new window will open, and you can check the reference for actions you might use in the game. Click the window, and drag it to place it anywhere you want. I placed it on the right of the playMaker menu. We need to reset the position of the Main Camera, since in VR, we don’t want look at the scene from a distance. 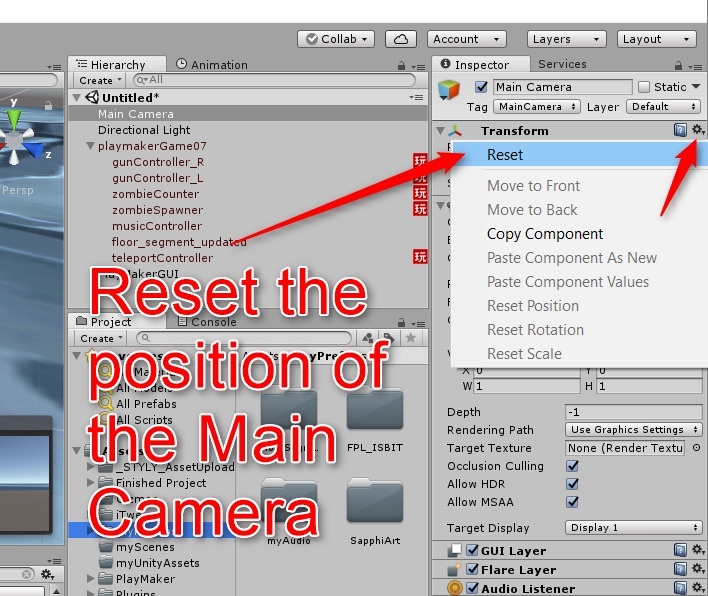 Click the Main Camera in the Hierarchy, click the gear icon, and choose Reset from the dropdown menu. Finally, we need to create a empty Game Object in the Hierarchy of the scene. This Game Object will function as a parent of all the other Game Objects. This will be needed for the final step in this tutorial, the uploading to STYLY. The prehab has to include all the elements of the scene, and has to be a single object. 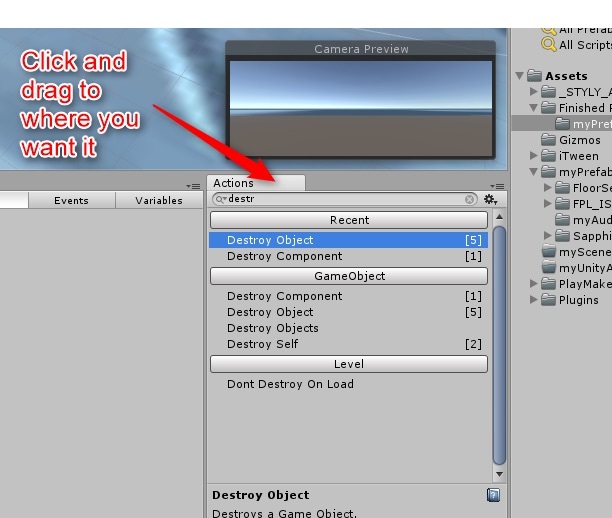 By performing this step, you can store all the Game Objects into this empty Game Object as children. 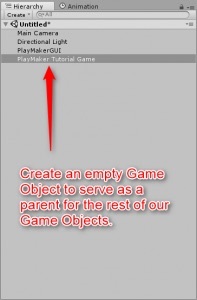 I named the Object “PlayMaker Tutorial Game”. We’re done with the initial setup, and we can move to the next step now!